The 2016 Bi-State Conference was held on 25–26 November in the scenic Tasmanian city of Launceston, located at the head of the picturesque Tamar Valley. The conference venue was Peppers Seaport Hotel, situated on the bank of the North Esk River. Peppers Seaport Hotel, Launceston. Venue for the 2016 Bi-State conference. The Bi-State Conference was jointly organised by the ASM VIC Branch and the ASM Food Microbiology SIG. The combination of these energetic working parties resulted in the compilation of an excellent and diverse scientific program for the meeting. The presentations broached a wide range of microbiology areas including clinical, diagnostic, public health, virology, veterinary, environmental, food and aquaculture. In total 16 oral presentations were delivered, and the 2016 conference also saw the inclusion of a poster session with 15 posters presented over the course of the 2 days. The opening presentation of the conference was delivered by Professor Jodie McVernon of the Doherty Institute and University of Melbourne, giving an engaging insight into the use of historical data to create models to predict the efficacy of vaccination programs directed towards pertussis. There was a strong representation of the application of next-generation sequencing technologies to microbiological research throughout the conference, and Associate Professor Ashley Franks of La Trobe University presented research from his group on its use in high resolution profiling of rhizosphere microbial communities. The second session on day 1 started with an informative presentation by Angelina Jackson of the Royal Hobart Hospital describing their experiences with MALDI-TOF in a clinical setting. Professor John Bowman of the University of Tasmania then showed how metagenomic profiling of meat spoilage organisms could be used to predict growth rates and shelf-life of vacuum packed meats. The Chief Scientist of Dairy Food Safety Australia, Deon Mahoney, then closed the second session with insights into some recent outbreaks of bacterial illness linked with dairy foods, notably recent outbreaks caused by Listeria monocytogenes and Shiga-toxigenic Escherichia coli. This year’s conference program included two technology presentations presented in session 3. Dr Antonio Castillo of ThermoFisher opened by demonstrating how acoustic focussing can dramatically increase the throughput and efficiency of flow cytometry, and how this presents advantages to identifying rare events in microbial populations. Then Jaelyne Birrell and Jeffery Hochgesand-Sunjaro of Microgenetix presented platforms available for identification and subtyping of bacterial isolates, including MALDI-TOF and Rep-PCR. Two presentations rounded off the opening day of the conference, the first given by Associate Professor Joe Tucci of La Trobe University. Associate Professor Tucci discussed the application of bacteriophage as novel anti-bacterial agents, presenting a promising alternative to antibiotics for treating epithelial tissue infections. Professor Tom Ross then discussed the fascinating application of bacteria to produce synthetic sandstone through cementation of sand grains. This biological process has the potential to revolutionise building materials and has drawn attention as a possible mechanism to prevent desertification. Between sessions attendees had the opportunity to network and visit the trade displays, with an excellent lunch and other refreshments provided at the venue. That evening attendees had the option of joining their colleagues at the Hotel Grand Chancellor for dinner. Day 2 was opened by Professor Barbara Nowak of the University of Tasmania. A world expert on amoebic gill disease, Professor Nowak presented data on some of the important microbial pathogens of significance to mariculture. Dr Jaclyn Pearson of the Doherty Institute and University of Melbourne then presented insights into how enteropathogenic E. coli can modulate the host cell response to infection by shutting down various signalling pathways. Dr Scott Chandry of the CSIRO then demonstrated the power of metagenomics in understanding microbial communities, in this case how it can be utilised to understand contamination patterns in food production systems. 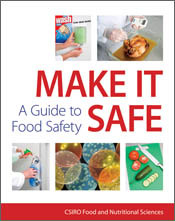 This valuable information is helping to dramatically improve food safety and our knowledge on how pathogenic and spoilage organisms contaminate foods. The following session included presentations on human public health and animal health. Dr Deborah Williamson, Deputy Director of the Microbiological Diagnostic Unit Public Health Laboratory, gave a riveting demonstration of how whole genome sequencing applied to public health outbreaks for rapid and effective response. Of particular note Dr Willamson showed how this technology can detect otherwise unknown outbreaks occurring in various jurisdictions, showcasing how this technology is revolutionising the field of epidemiology. Veterinary Epidemiologist Dr Kevin Ellard then described an outbreak of herpesvirus which infected Pacific oysters cultivated in Tasmania, and demonstrated how this can have important repercussions for market sustainability. Dr Deborah Williamson, Deputy Director of the Microbiological Diagnostic Unit. The final session of the conference included two presentations on communicable disease control and public health policy. Associate Professor Mark Veitch of the Tasmanian Department of Health and Human Services described the current structures in place in Australia governing communicable disease control, and highlighted the discussion over the past 30 years as to whether Australia should have its own single ‘Centre for Disease Control’ institution. Dr Heather Haines of the Victorian Department of Health and Human Services closed the scientific program by discussing food safety policy and regulation. In particular Dr Haines highlighted that while new strategy and policy development endeavours are shaped by scientific knowledge, the final outcome may not fully reflect the original information base. Dr Heather Haines, Department of Health and Human Services, Victoria. The 2016 Bi-State Conference saw the introduction of poster presentation sessions, which included 15 poster presentations drawn from a wide variety of microbiological areas, and a poster prize for the Best Student presentation, proudly sponsored by the ASM Victorian Branch, and awarded to Tamsyn Stanborough. Tamsyn is currently undertaking her PhD through the University of Tasmania but is based at the CSIRO in Victoria. Tamsyn presented some of her research characterising the sortase enzyme of Brochothrix thermosphacta, which has an important enzymatic role in anchoring membrane-bound proteins. From left to right: Winner of the Best Student Poster Presentation, Tamsyn Stanborough, CSIRO; Karena Waller; Ed Fox. The Organising Committee would also like to thank our very generous conference sponsors, which included The Australian Society for Microbiology, ThermoFisher Scientific, Microgenetix, Sysmex and Becton Dickinson.